A comedy about friendship and coming of age, Ferris Bueller's Day Off is a deceptively simple story about a high school teen getting a jump start on life as an adult. 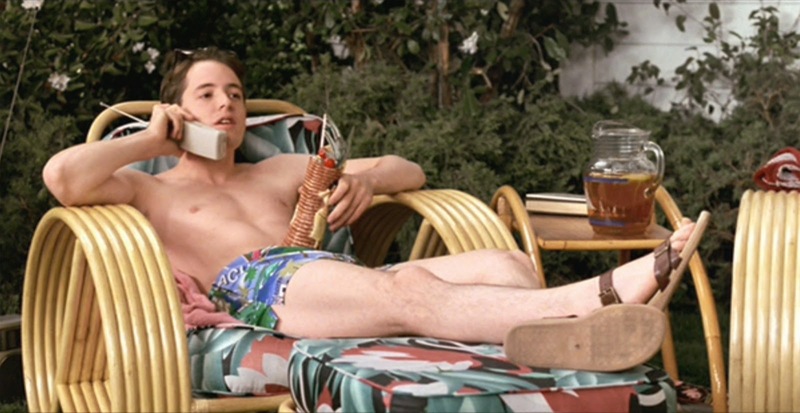 Resourceful Chicago high school senior Ferris Bueller (Matthew Broderick) feigns sickness, fools his parents (Cindy Pickett and Lyman Ward) and skips school for the day. 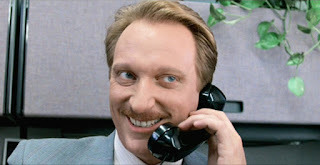 After some effort, he convinces his uptight and frequently sick friend Cameron (Alan Ruck) to also take the day off. Together they concoct a plan to smuggle Ferris' girlfriend Sloane (Mia Sara) out of school, from under the nose of principal Edward Rooney (Jeffrey Jones), a ruse that involves driving the precious vintage Ferrari belonging to Cameron's dad. Ferris also spreads rumours that he is practically on his death bed, triggering an outpouring of sympathy that spreads throughout the city. Both Rooney and Ferris' sister Jeannie (Jennifer Grey) are convinced that Ferris is not sick at all and separately set out to catch him in the act. Meanwhile Ferris, Cameron and Sloane enjoy a day that includes trips to the Sears Tower observation deck, a Cubs baseball game, a meal at a snooty restaurant, visits to the art gallery and the mercantile exchange, and impromptu participation on a parade float. Rooney and Jeannie suffer their own misadventures as they try to uncover what the trio are up to, and Ferris will need all his wits to wrap up the day with no one the wiser. Written and directed by John Hughes in the heart of his personal golden era, Ferris Bueller's Day Off is the definitive teen dream movie. The film is funny, fast-paced and also the perfect Chicago travelogue, Hughes showcasing the best that his favourite city has to offer on a gloriously sunny day. The central character is cool, calm and courageous, always several smart steps ahead of anyone trying to ruin his day. And the film's mantra of life moves pretty fast -- if you don't stop and look around once in a while, you could miss it, may as well be the most perfect pre-written excuse to occasionally step off the treadmill and test all of society's rules. Ferris narrates the film and regularly breaks the fourth wall, adding to his appeal and firmly pulling the audience to his side and against his adversaries. And Ferris' opponents are easy to boo, with Rooney the worst type of bug-eyed foam-at-the-mouth authority figure, and Jeannie the sibling too worried about what her brother is up to rather than carving her own path (her perspective only changes upon meeting her own rebel in the form of Charlie Sheen). Building on his break-out success in 1983's WarGames, Broderick finds his perfect role as Ferris Bueller. His boyish charm and the sly but disarming smile are deployed to full effect, and it's impossible to dislike his roguishness. 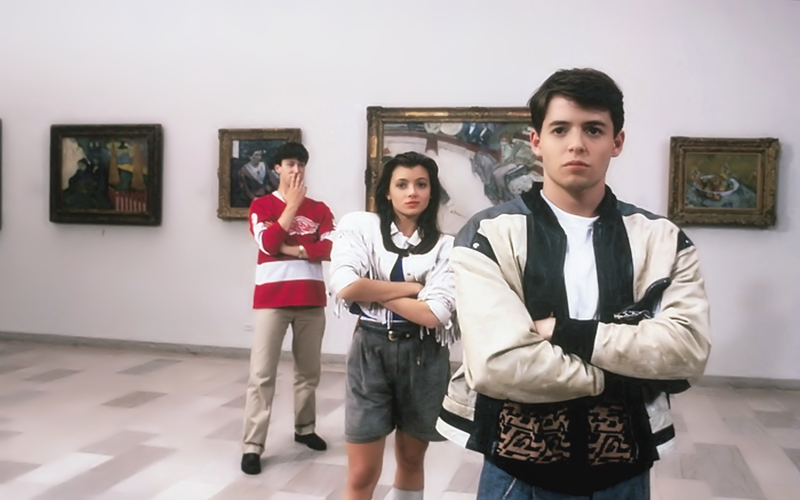 Indeed, a large part of the film's appeal lies in Ferris being universally liked by all the high school factions, an impossible ideal that elevates the character's powers to legendary status in teen circles. While superficially about a kid who takes a day off, Hughes has a couple of not-so-hidden agendas, and he reveals them early. Not too many high school kids skipping school choose to go to an art gallery, the mercantile exchange, or a stuffy restaurant. Fewer still would propose marriage to their girlfriend. These are literal and figurative adult actions and destinations, and the intrepid Ferris is using his last day off crack open the door to the grown-up world that he and his friends will need to soon live in. And the greater purpose of the day emerges in the relationship between Ferris and Cameron. Initially Ferris' insistence that Cameron join him in skipping school appears self-serving (he needs to drive that Ferrari! ), but Cameron's quietly tortured character emerges as the one spot of darkness at the heart of the film. Ferris' agenda blossoms as the afternoon progresses, and rather than achieving personal fulfillment, his goal is revealed to be much more about providing an emotional lift to a friend in need, the most satisfying act on a most lively day off. If I awarded half stars, this would likely earn 4.5! Ferris is a touch too perfectly smart for a teen and the principal is more of a cartoon character than an actual person; otherwise, I agree this is a nearly perfect film.